Give your home a low-maintenance makeover that will last a lifetime with our unbeatable selection of tile flooring. Our tile floors bring a special look and feel that increases the value of any home or business and lasts for years. Tile resists fire, frost, moisture, scratches, stains, and slips, and is also easy to clean. All you need is a mop and a broom to keep your floor looking fresh. When you choose our floors, you and your guests will never have to worry about spills again. Our selection of porcelain, slate, and ceramic tile carries a wide variety of styles, colors, and patterns along with a high value. You’re never limited to a common square pattern. Our tile flooring installation team can help you create all kinds of choices, like the popular brick or checkerboard patterns. You also have the option of easily creating tile borders for that extra artistic flair. If you’re not sure which one will fit your home best, our design and flooring experts will be happy to help. Classical enough to stay popular for centuries yet versatile enough to be used in any room, ceramic tile is one of the best flooring choices. Our ceramic tile encompasses creative designs, long lasting material, and moisture resistance for the perfect combination of strength and beauty. You can even combine it with carpet and wood for a unique style catered to your home. As gorgeous as it is strong, porcelain tile from our selections can be customized to match any décor with unlimited numbers of trim pieces and accents to choose from. We can apply it to formal and informal settings and can also design it to resemble marble, travertine, and natural stone. Best of all, porcelain naturally resists bacteria and allergens and holds up perfectly even in high traffic, which means that for you, the more the merrier! Slate is one of the most durable and long-lasting choices for any wall or floor. Our slate tile is completely waterproof, making it perfect for bathrooms, kitchens, driveways, and pool areas. We supply heavy-duty material that’s well suited to high traffic homes with young children, so moms and dads can let their kids play without compromising their homes. Trust our professionals to give you a flawless floor that will look great and last long. 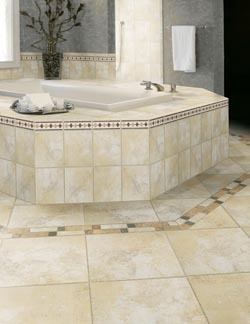 A quality tile flooring installation is every bit as important as the quality of the products you buy. After you choose your tile, we’ll deliver it, take measurements, and lay it to last. Our skilled and experienced installers have the tools and the training to ensure your tile flooring fits right and stays strong. Our high speed installation time is matched by high-quality standards. We offer a 30-day replacement policy and a lifetime guarantee rarely found in the flooring industry. If there is ever a problem, we correct it at our expense. Contact us for information on tile flooring samples and estimates for your project. We proudly serve customers from Linton, Indiana, and all of the surrounding areas.